The user account that you select must have Administrator or Power User permissions on the HPE Nimble storage system. Veeam Backup & Replication uses HPE Nimble RESTful API to communicate with the storage system. By default, commands to the RESTful API server are sent over port 5392. If you use another port for HPE Nimble RESTful API, you can change the port number. [For Nimble OS 2.3 and later] A thumbprint of the TLS certificate installed on the management server. [For Nimble OS 2.3] A fingerprint of the SSH key of the management server. During every subsequent connection to the server, Veeam Backup & Replication uses the saved information to verify the server identity and avoid man-in-the-middle attacks. 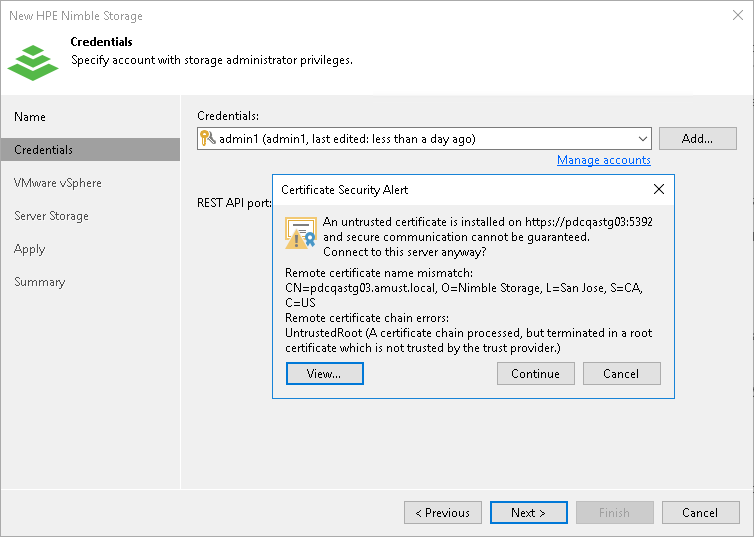 [For Nimble OS 2.3 and later] If the certificate installed on the server is not trusted, Veeam Backup & Replication displays a warning. [For Nimble OS 2.3] To let you identify the server, Veeam Backup & Replication displays the SSH key fingerprint.To accept the fingerprint and connect to the server, click Yes. If you click No, Veeam Backup & Replication will display an error message, and you will not be able to connect to the server. If you update the certificate or SSH key on the server, you must acknowledge the new certificate or SSH key in the server connection settings. To do this, in the Storage Infrastructure view right-click the storage system, select Edit storage, pass through the Edit Server wizard and click Trust.